Probably the world’s first song-cycle with guitar. This is a new re-engraved edition of Federico Moretti’s Doce Canciones which are twelve love-songs loosely arranged in the form of a song-cycle, all of them with similar accompaniments, an instrumental introduction and ending, a carefully worked-out musical form, and a close attention to detail. Their composer, Federico Moretti, was an Italian born in Naples in 1769 who came to Spain in 1794, became an officer in the Spanish army and rose to the rank of field-marshal (mariscal de campo). He combined throughout his life a military career with a love of music and in particular of singing and the guitar. He had an influence on his younger contemporary Fernando Sor who dedicated to him at least one of his own works. 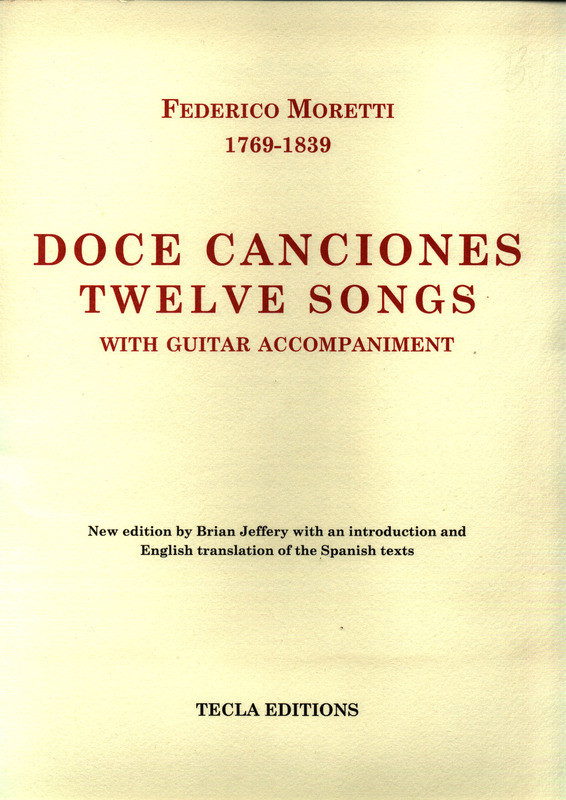 I published Moretti’s Doce Canciones in 1978 as a facsimile of the original London edition of about 1811, but here now is a new edition, this time modern and re-engraved, with a new introduction. 56 pages. Large music size 24 x 31 cm. A handsome new edition on high quality paper, paperbound. Paperbound only. This edition is uniform with two other new publications of Tecla Editions: Ferandiere’s book Arte de tocar la guitarra española (Madrid, 1799), and the first modern edition of Ferandiere’s Seis Dúos for two guitars (by the way, you can hear two of those six duos played on Soundcloud). Here is that same song “Si te veo, si te hablo” sung by Hezy Levy accompanying himself on the guitar.